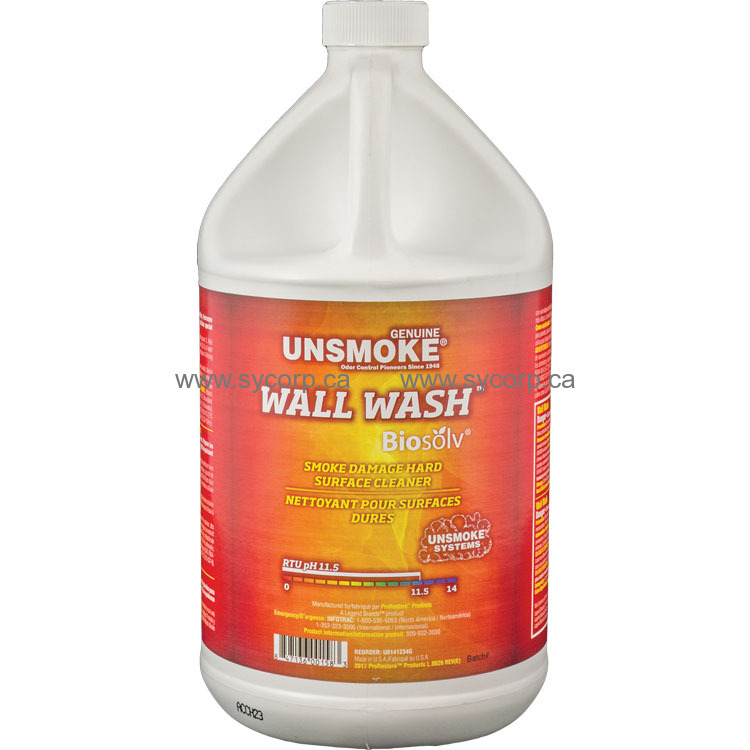 Wall Wash is formulated with proprietary brightening and deodorizing agents for cleaning smoke-damaged hard surfaces. This product is especially effective for prepping walls for painting – it quickly removes both oily and dry soot, and does not require rinsing when used as directed. Especially effective for cleaning up after grease fires. A truly multi-use product, Wall Wash can also be used as a powerful degreaser for parts washing and can be added to any cleaning agent to boost odor control. 1. Remove excess smoke and soot using a lamb’s wool duster or HEPA filter vacuum. 2. After testing the contamination level and surface durability, add 4 oz. and up to 32 oz. (125 to 1000 mL) to each gallon (3.8 L) of water depending on the severity of the job. 3. Apply diluted Wall Wash with a wall cleaning machine, or spray on, and wipe down. 4. Rinsing with water is recommended if used at higher concentrations, or if used to clean high-touch surfaces. 1. Mix 8 ounces (250 ML) of Wall Wash per gallon (3.8 L) to any ordinary cleaning solution for use on walls, floor or other hard surfaces. 2. Rinsing with water is recommended if used at higher concentrations, or if used to clean high-touch surfaces.